These thoughts raced through my mind more than once over the years as I tried numerous adjustments and purchases to achieve perfection in arrow flight. 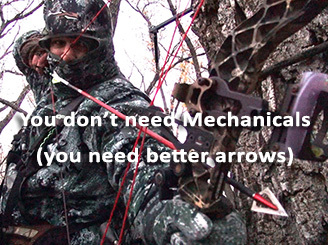 Most of the struggles revolved around the effects of fixed-blade broadheads steering flexible arrows awry. I can recall some setup sessions that cost me several packets of various broadhead styles before arrows grouped in some semblance of consistency, and even then I didn’t trust results past 40 yards. Some of those issues went away with the refinement and dependability of expandable broadheads, but from time to time, I still pined to put a fixed-blade broadhead into play. What then? The answer to this dilemma is to team up the best components such as a trusted fixed blade broadhead, but that still leaves you wading through dozens of arrow options with flex challenges. The innovative design of Carbon Express’ new Maxima Red arrow solves this dilemma with shaft engineering based on simple physics. It’s no secret that arrows flex when launched from a bow. This flex is exaggerated if you’ve ever watched the process in slow motion video photography. To alleviate flex, arrow manufacturers increase the strength of the shaft which is measured using a term called “static spine.” Static spine refers to the amount of bend a 28-inch arrow has with a predetermined amount of weight hung from its center while at rest. Construction materials and geometry determine how much the arrow will bend during this test. With dynamic spine controlled more effectively it allows you to incorporate any fixed-blade or mechanical broadhead onto a Maxima Red with trust in its flight. This arrow allows you to shoot better groups and increase your range through confidence. Maxima Red arrows also include several other important elements required in a trusted hunting arrow. Regardless of whether you purchase a six- or 12-pack, Maxima Red arrows are sorted and matched by weight and spine with a +/- 0.0025-inch range for spine and a weight tolerance of +/- 1.0 grains. Plus, arrows are laser tested for straightness to a noteworthy range of 1/10,000 of an inch. The straightness tolerance of +/- 0.0025 inch is a maximum limit, not an across-the-board average. Although many of you may place more emphasis on the broadhead end of an arrow the nock also plays a vital role in reliable accuracy. Maxima Red arrows each come equipped with the Launchpad Precision Nock.. The Launchpad Precision Nock helps to ensure alignment on the string and a consistent launch for precision shooting. 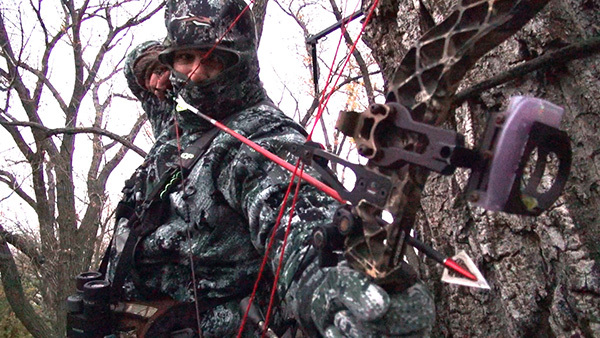 Bowsite Founder Pat Lefemine has always preferred 2-blade fixed broadheads. Achieving perfect arrow flight is now easier than ever with CX Maxima Red arrows. For me, the clear advantage of the Maxima Red arrow is the freedom to swap out broadheads with fewer hassles in tuning a new combination to my Mathews. Although most of you strictly hunt whitetails, switching broadheads for various game is a real issue for the seasoned hunter. Moose, elk, pronghorn, cottontail and even the armored body structure of the feral hog make you consider various broadhead construction options. This swap dilemma becomes moot with the technology advancement of the Maxima Red arrow and the reason I keep a quiver full ready for the hunt. Of course the advantage of tighter groups from the new Maxima Red arrow combined with my current Mathews/fixed blade setup also makes the choice clear. It’s a guaranteed first step toward more trophies this season.